Published: Nov. 19, 2013 at 06:23 p.m. 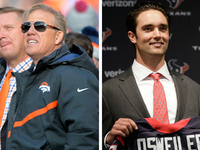 Updated: Nov. 19, 2013 at 07:22 p.m.
Can the New York Giants go from worst to first in less than two months? That's the question running rampant in New York on the heels of a four-game winning streak that has the G-Men just 1½ games behind the NFC East-leading Philadelphia Eagles -- after they started off 0-6. Sure, it's easy to dismiss the Giants as legitimate title contenders, based on their sub-.500 record at this point, but the team's history of streaking into the playoffs makes it impossible to ignore Tom Coughlin's bunch. 1) Eli Manning has stopped giving away the ball. 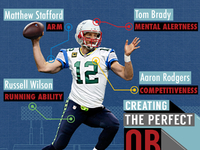 Turnovers are the biggest deciding factor in the NFL. Statistics repeatedly bear this out: Teams that win the turnover battle win the overwhelming majority of games. Over the past five seasons, teams with positive turnover ratios have won over 78 percent of the time (810-220-2), with teams enjoying "plus-2" (81.8 percent) and "plus-3" (93.1) turnover advantages prevailing at extremely high clips. Coughlin frequently cites these statistics throughout the week at various team meetings, constantly preaching the importance of ball security to offensive players and kick-return specialists on the practice field. Yes, most coaches stress this, but I can personally attest to the emphasis Coughlin places on winning the turnover battle from my time playing under him as a member of the Jacksonville Jaguars in 1996 and '97. Coughlin would show various charts and graphs outlining the importance of the turnover margin in daily meetings, and he'd follow up with lengthy lectures featuring various examples from the weekend's action. Given my familiarity with Coughlin's approach, I'm sure Manning's carelessness with the ball early in the season drove the coach crazy on the sideline. The veteran quarterback tossed 15 interceptions during the Giants' first six games, with a number of his miscues resulting from poor decisions made under duress. 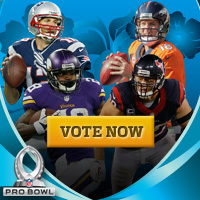 (Manning seemingly would chuck the ball into traffic with little regard for the consequences.) As a result, New York gave opponents extra possessions on shorter fields while forfeiting its own scoring chances. 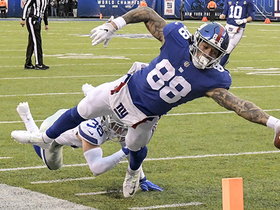 In a league where games routinely are decided by seven points or fewer, it's easy to see how the G-Men stumbled out of the gate with six straight losses. During the recent winning streak, Manning is making much better decisions from the pocket, willingly hitting the safety valve when his primary and secondary reads are covered. This has resulted in the Giants facing fewer long-yardage situations against loaded defenses designed to take away intermediate and deep throws. Although the dink-and-dunk tosses don't produce eye-popping numbers, they do force the defense to defend every area of the field. 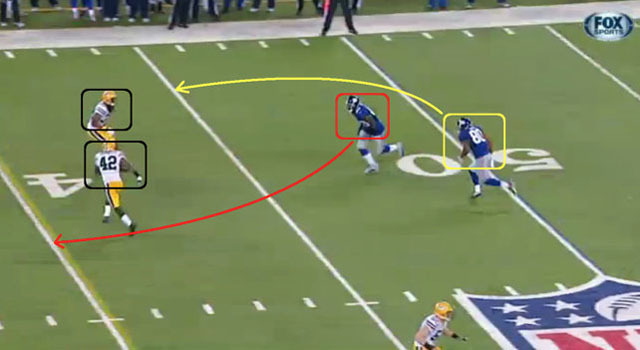 Inherently, Manning has been able to push the ball down the field to exploit voids at intermediate range. 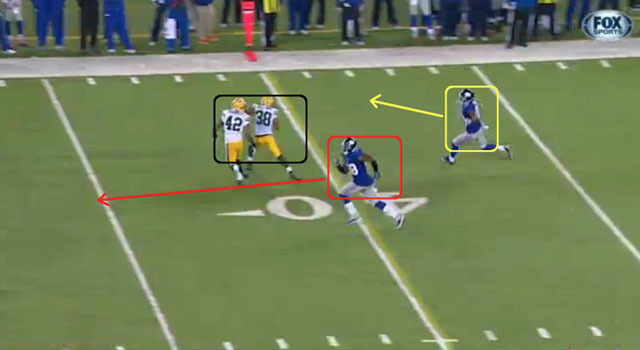 Thus, Victor Cruz, Rueben Randle and Hakeem Nicks have re-emerged as factors on the perimeter. 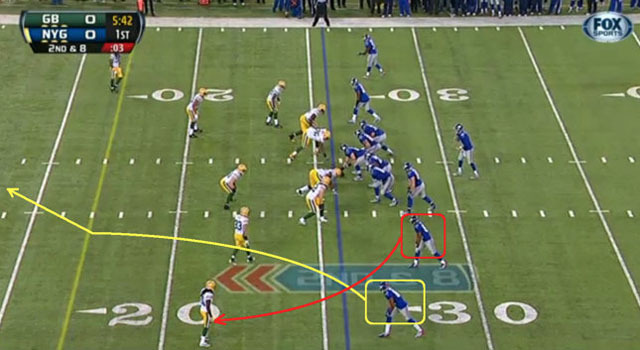 In Sunday's 27-13 win over the Packers, the Giants took advantage of the aggressiveness of Green Bay's underneath defenders. 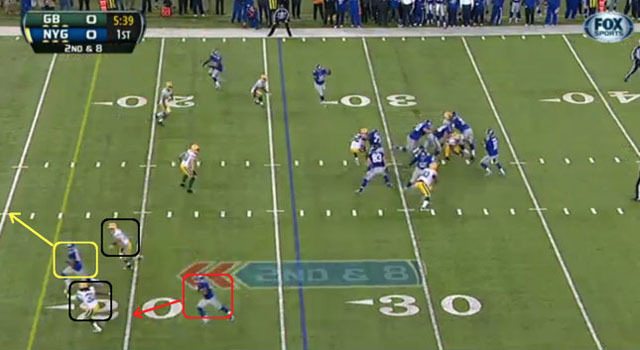 In the video clip to the right, Cruz runs a stick-nod route from the slot. 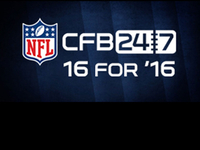 (This is an effective complement to the option routes Cruz routinely runs as a slot receiver.) By executing a stutter-step move at 8-to-10 yards, Cruz baits the underneath defender (Clay Matthews) into breaking on the option route ... before making a hard break down the seam. Manning set this up by throwing a few quick passes earlier in the game, allowing the double move to net a big gain. The Giants have helped Manning by using a variety of switch-route combinations to exploit overaggressive defenders down the field. 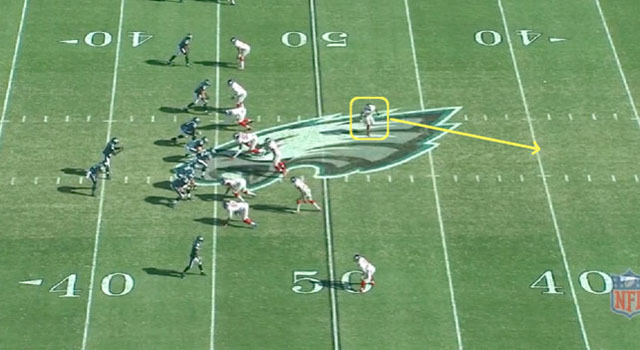 These concepts are effective against any coverage -- the natural picks can create space for receivers down the field against man-to-man or generate confusion among defenders in zone coverage. Additionally, Manning has successfully executed these routes throughout his career, leading to more confident and decisive throws from the veteran. 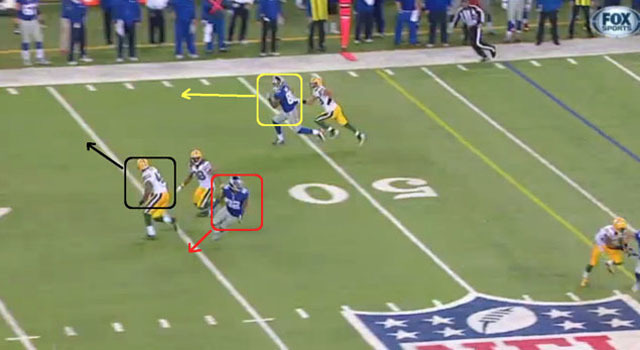 The screengrabs below, taken from Sunday's win, show how the Giants use the concept to produce big plays with all three of their top receivers. After watching their star quarterback struggle through a disappointing six-game stretch, the Giants simplified their passing game to help Manning play with more confidence from the pocket. Consequently, the Giants have been able to reduce costly mistakes -- Eli has thrown just two interceptions during the four-game winning streak -- and get more efficient production from the aerial attack. 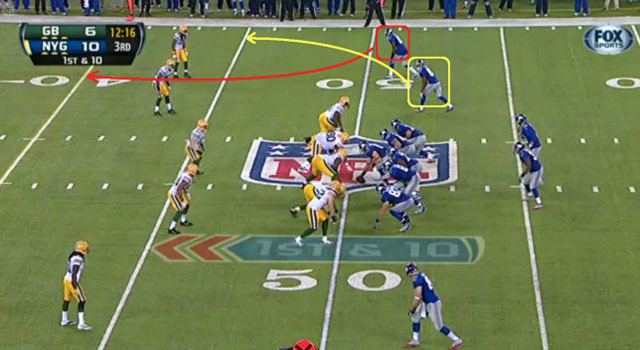 2) The Giants' patchwork backfield has sparked the running game. It's no surprise that the four-game winning streak has coincided with the re-emergence of the Giants' ground game. New York struggled mightily in this area early on, as shoddy ball security and poor health leveled David Wilson's second NFL season. But recently, the ability to run the ball effectively has allowed the team to utilize a balanced game plan, taking some of the pressure off Manning's shoulders. Additionally, this has enabled the team to play ball-control football while also setting up big-play opportunities off play-action. Given Coughlin's old-school offensive philosophy, a stout rushing attack is to be expected. 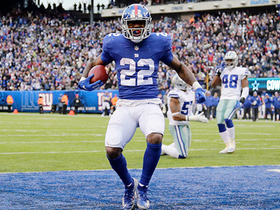 But the production Big Blue has received from a patchwork backfield -- consisting of Andre Brown, Brandon Jacobs and Peyton Hillis -- has raised eyebrows around the league. Jacobs and Hillis are veteran power runners with size and strength. Although their skills have significantly diminished from their prime years, these two have mustered enough production to keep opponents honest on early downs. 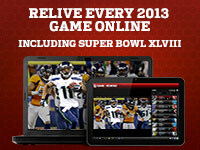 Hillis' brief resurgence bought the Giants some time to wait for Brown to make a healthy return to the lineup. Brown, a fifth-year pro, has shown potential as a feature back whenever he has received a steady workload. Last season, he rushed for 385 yards on 73 attempts, including a 20-carry, 113-yard effort against Carolina that showcased his rugged running style. Although injuries have marred his brief career, Brown has displayed the same grit and toughness since returning to the field two games ago. He pounded Oakland for 115 yards on 30 carries and tallied 93 yards from scrimmage on 21 touches against Green Bay. Brown's ability to pick up the 4-yard gain has made the biggest difference in the Giants' running game. Instead of dancing around at the point of attack and looking for a home run, Brown hits the hole with a simple mindset: pick up positive yardage. As a result, the Giants are more effective on early downs, creating manageable distances for Manning on second and third down. Also, the hint of a potent running game has opened up the field for Manning on play-action passes. 3) Perry Fewell's defense is back on track. The Giants' defense failed to live up to expectations during the first six games of this season, with injuries and inconsistency plaguing every level of the unit. Jason Pierre-Paul struggled in his return from back surgery, while the linebackers and defensive backs struggled with communication and chemistry. As a result, the Giants surrendered 34.8 points per game during that 0-6 start, forcing just seven turnovers in the process. Since Week 7, however, the Giants have rediscovered their defensive mojo, with the pass rush and coverage working together to keep opponents from generating big plays through the air. The Giants have registered eight sacks over the past four games, also producing 11 takeaways during the winning streak. Additionally, the defense has allowed just two offensive touchdowns in the past 18 quarters of action after allowing 19 in the first 22 quarters (5.5 games). 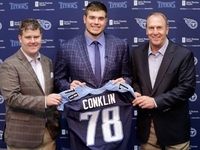 While some will point to the offensive ineptitude of their opponents (Minnesota, Philadelphia, Oakland and Green Bay) as the catalyst behind this defensive resurgence, I believe the unit has started to round into form under Fewell. The wily defensive coordinator has patiently worked Pierre-Paul back into the mix while also integrating former Pro Bowl linebacker Jon Beason into the lineup. Also, New York has received timely playmaking from Antrel Rolle and Prince Amukamara in the back end to solidify the weakness of the defense. Pierre-Paul is regarded as one of the premier edge specimens in the NFL, but lingering back issues have kept him from consistently playing at a high level this year, explaining why he's posted just two sacks. However, Pierre-Paul has shown signs of regaining his stellar form in recent weeks, with a sack against Oakland in Week 10 and the spectacular pick-six against Green Bay in the above video clip. 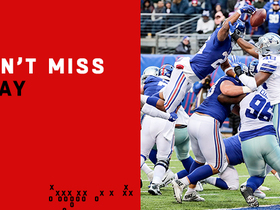 These impact plays alter the momentum in games and change the way opponents block the Giants' front line. More importantly, the disruption leads to a feeding frenzy on the back end that results in big hits and turnovers by Rolle and his crew. Beason arrived as an unheralded trade acquisition after struggling with injuries during his final few seasons in Carolina. With the emergence of Luke Kuechly, the Panthers moved Beason from the middle to weakside linebacker, and the former Pro Bowler had trouble playing out of position. Carolina shipped him to New York in early October. 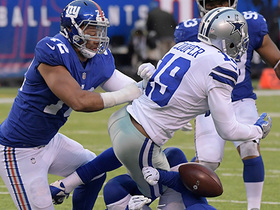 Sparked by a return to his natural position, Beason has played lights-out for the Giants. He has racked up 36 tackles in five starts, including a 12-tackle effort against Chicago that truly showcased his disruptive skills. Beason has also assumed some of the leadership duties of the defense while adding an imposing presence in the middle of the field. 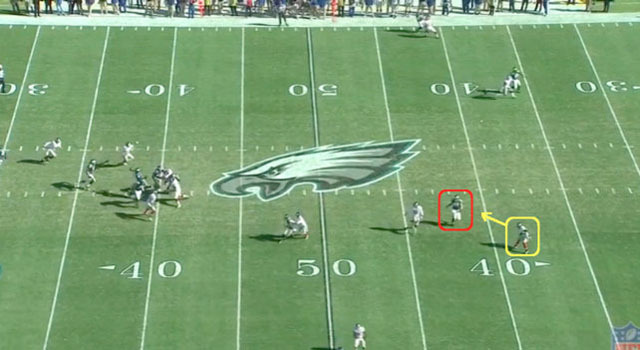 This was apparent Sunday, when he snagged an interception on a bang-slant (see the video clip just above). The Beason trade is one of the biggest reasons the Giants' defense suddenly shows more bite against the run and pass between the hashes. The final factor in New York's defensive turnaround is the improved play in the secondary, headlined by Rolle and Amukamara. The duo has been outstanding in the back end, shoring up a unit that surrendered 14 passing touchdowns during the first six weeks of the season. Looking at the All-22 Coaches Film from the past four games, I see a more active and aggressive Rolle lurking in the middle of the field. He is attacking balls thrown between the hashes, and his combination of instincts and awareness has produced critical turnovers. This results in a big interception for the Giants. In Amukamara, the Giants finally have found a competent player to fill the No. 1 cornerback position. The third-year pro is starting to play up to his potential as a former first-round selection by locking down receivers on the perimeter. Although his technique is still a little sketchy, Amukamara's competitiveness and athleticism have upgraded the unit. And the young player's burgeoning confidence has allowed Fewell to utilize more man coverage -- press man, in particular -- on passing downs. With Amukamara capable of taking away the easy, quick throws to the outside -- as evidenced in this video clip -- the Giants have been able to force opponents into longer throws, allowing the pass rush to get home more often.